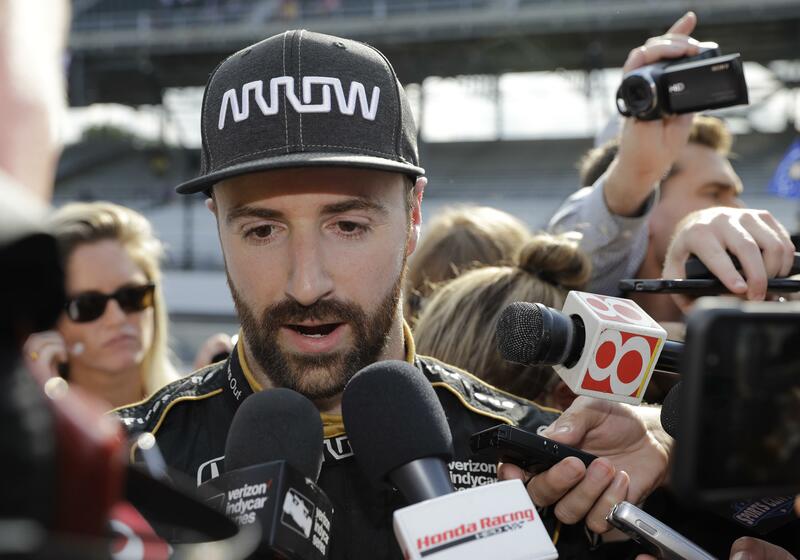 INDIANAPOLIS – James Hinchcliffe is no longer looking for a way to get into the Indianapolis 500. The Canadian driver used a Twitter post Wednesday to announce that, “barring unforeseen circumstances,” he would not start Sunday’s race and a decision had been made to stop “pursuing other options” after he failed to make the 33-car field during qualifying last weekend. Missing IndyCar’s showcase race, which is worth double points, likely takes Hinchcliffe out of the series championship hunt. He is currently fifth in the points standings. It appears the only way Hinchcliffe could race now would be in the unlikely event another driver is injured during Friday’s final practice session and wasn’t cleared to drive in time for race day. Even then, it could be tough because he is the face of a national advertising campaign for Honda – eliminating the possibility he could drive a Chevrolet-powered car. The Honda spots featuring Hinchcliffe are expected to run throughout the race and the primary sponsor of Hinchcliffe’s No. 5 car, Arrow Electronics, has its name on temporary suites set up in the first turn at Indianapolis Motor Speedway. The other driver who failed to make the field, Pippa Mann, was not expected to find a way into the race. But many figured Hinchcliffe, one of the series’ most popular and highest-profile regulars, would find another ride at the expense of less decorated or experienced driver. Speculation centered primarily on his Schmidt Peterson Motorsports teammates: Jay Howard, an Indy 500-only driver, and rookie Robert Wickens, who crashed in Monday’s practice. Instead of putting Hinchcliffe into one of those cars, team owner Sam Schmidt got Hinchcliffe’s sponsors to approve using their logos on the other cars in the team’s stable. When race purists celebrated the return of bumping during qualifying at Indy, nobody expected Hinchcliffe to be in this position. A combination of rain, bad timing and bad luck was simply too much to overcome. His slower than expected four-lap qualifying average on the first attempt following a 2-hour, 20-minute rain delay Saturday was the only official attempt he made. Four of his six Indy starts have come from the first three rows including the No. 1 spot in 2016. But he has had only two top-10 finishes on the speedway’s 2.5-mile oval – sixth in 2012 and seventh two years ago. But, as Hinchcliffe has noted repeatedly, he’s also been through worse. In 2015, he suffered a life-threatening injury when he crashed and a broken piece of his car punctured his leg and cut an artery. He missed the rest of the season but returned the next year and claimed Indy’s prized pole position. “He’s had a lot worse days here so that helps keep it in perspective,” Schmidt said. Hinchcliffe has taken responsibility for what happened and he has started focusing on the series’ next stop. Published: May 23, 2018, 11:26 a.m. Updated: May 23, 2018, 12:10 p.m.